I have something like this (BPA free) but I may get another one .. The 2.5 gallon size is ideal for drinking water. 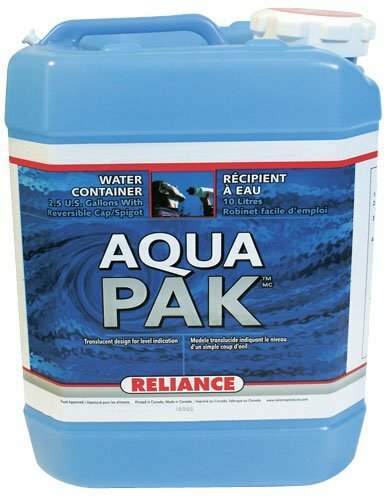 I use 5 gallon containers for bulk water to be used for cleaning etc .. I filter water in the berkee and then put it straight into the 2.5 gallon container. I also like this style because it is free standing so you can throw it in the back of a truck or anyplace and it stays standing. The 2.5 gallon size is also good for canoe trips or car camping. I have one of these Nalgene 1 gallon containers and just ordered two more. I think it will be a good container to leave some water in at the camp over the winter. It is a thick soft type plastic with no seams so it should be able to freeze ok. I leave some water in stainless steel pots that also freeze .. Very few containers won't burst if they are full and they freeze. For the winter, I use the "Emergency Water Pouches" in my truck. They hold about 4.5oz. of water each, but are designed with enough air space to freeze and not burst. I believe I bought two cases a while back, each one contained sixty pouches. Usually I keep two, one gallon jugs of water in the vehicle in warm weather. This is just for peace of mind until I can find a water source if things go "South". We also use those blue, five gallon Reliance brand jugs for camping. Five gallons weighs about forty pounds and two of them will keep us going for a long weekend. We freeze one gallon water "milk" jugs for use in our coolers. Don't actually use milk jugs as you can never get the smell and taste of old milk out. We use the jugs that are supplied for drinking water at supermarkets (usually less than a buck each). I always pour out a couple of inches before freezing and even then they expand and bulge pretty bad in the freezer. However, it sure is nice to have an ice cold drink from them as they slowly melt while keeping our food cold. Very few containers won't burst if they are full and they freeze. Come to think of it, I have a 1.5 litter (48 ounce) nalgene water container like the one shown below at my camp that is 85% or 90% full of water .. I had two of these and before I had my camp I used to leave them in my truck camper all winter with water in them. It has been sitting there at my camp full of water for the past 3 years or so and through the winters and has not split or cracked when it must have frozen and thawed many times over .. I think someone told me that that was the type of bottle to use for freezing and they are a soft plastic type of material .. I just left it there and forgot about it .. That's why I am thinking these 1 gallon nalgene of the soft plastic type would also work because it is very similar .. It's a soft plastic though a bit thicker. It's nice to have durable water containers that can freeze and not give out ..
"I love these white Nalgene bottles as the more flexible plastic freezes well, whereas the standard clear Nalgene bottles are more prone to shattering when freezing water in them. The 48 oz. bottle is great for packing extra water without taking up extra space. Fits just as well as the 32 oz. in the outer mesh side pouch of my pack." Which Type Of Plastic Should You Use For Freezing? 4. What kind of plastic are you using? Polyethylene terephthalate (PET) can be used and reused, but repeated washing may cause toxic chemicals to leach from the plastic into the contents. Recycle them when they become cloudy or cracked. High-density polyethylene (HDPE) containers are frequently used in the food industry for freezer containers. Low-density polyethylene (LDPE) plastic containers do not leach toxic chemicals into food and are often used for freezing foodstuffs. I have a $20 WATER BOB that will fit in my bathtub and safely hold 100 gallons of drinking water. At my BOL,water ,and an active filter ( ceramic,carbon,UV light)provides near unlimited water from a nearby lake or a deep well. I use a blue plastic 5 gal one for camping, works well for cleanup, drinking, etc with the spout.